Water Heater Leaking from Bottom: Where’s it Coming From? Water in Basement: What’s the Cause? A tankless small water heater can be used as a stand alone unit or a booster to help deliver hot water to a bathroom that's not well served by the main water heating system. When a water heater is installed near the source it will serve (such as a sink), it's called a point-of-use water heater, and in most cases, this is the role of a small water heater. In this post, we'll show you how to buy a tankless small water heater. It's not hard once you know what to look for and how manufacturers rate their units. Then, we'll show you some of our favorites. You'll be armed with the information needed to find the right unit to meet your needs. As you begin shopping for tankless water heaters, you'll find that the flow rate is frequently the most common term used when selecting the unit's size. When you shop for a tank-style water heater it's critical to choose one that has a large enough tank to meet your hot water demands. The same is true with tankless units, only instead of selecting the correct sized tank, you need to determine the correct flow rate. Get the flow rate wrong, and you'll find yourself in cold water . . . literally. Water enters a tankless water heater cold and is heated as it travels thru the unit. The number of gallons the unit is capable of heating each minute (gallons per minute or GPM) is called the flow rate. If a tankless unit is capable of heating 2.5 gallons of water each minute, it has a flow rate of 2.5 GPM. The majority of tankless water heaters have a flow rate of .50 to 2.25 GPM. It's important to get the flow rate right or the unit won't be able to keep up with the demand. In which case, instead of hot water, the tankless will deliver cold or luke-warm water. Another thing to consider is the amount of hot water needed at any given moment. According to 2010 Plumbing Standards, a standard shower head uses 2.0 GPM and a hand sink will draw .50 GPM. It's important to know the demand so you can determine the GPM you'll need. Think of it like this; your tankless is designed to deliver 1.25 GPM, but you actually need 1.75 GPM for your shower. Your shower probably won't be cold, but it certainly won't be as warm as you'd like. Since the same rules apply when selecting a point-of-use tankless water heater as a whole house system, you can check out our more extensive article on how to buy a tankless HERE. Just keep in mind, that you'll only need to focus on the areas that the tankless small water heater will be servicing, such as a bathroom or a kitchen sink. Temperature rise is simply the difference between the temperature of the water that enters the tankless and the temperature of the water when it leaves. The temperature the water enters your home varies since water is colder in the Winter than it is in the Summer. If you live in a cold climate, it's even colder. You may wonder why this matters if you select a water heater with the correct flow rate. Simply put, it matters a lot. When the incoming water enters your home at 65-degrees and tankless delivers hot water at 110-degrees, the temperature rise is 45-degees (110 - 65 = 45). But if it's Winter, the water is coming into your home at 40-degrees, your tankless will need to increase the temperature (temperature rise) by 70-degrees! (110 - 40 = 70). The same unit that may have been able to effortlessly deliver 2.5 GPM in the Summer may now be struggling to deliver .50 GPM in the Winter! A tankless water heater isn't necessarily able to work harder when the temperature rise is higher, and that means it'll deliver a lower GPM. In other words, you may need to purchase a more powerful unit (higher flow rate) to meet your hot water needs in the Winter. Often you'll find that manufacturers tend to lead with the unit's GPM. But to accurately compare the efficiency of one unit to another, it's critical that you also pay attention to the temperature rise. One thing to keep in mind when purchasing a point-of-use water heater, is that sizing is not as important as when you're buying a unit that'll be servicing your entire house. If you are looking to buy a unit to deliver hot water to a hand sink for a secondary bathroom or a shop, a .50 GPM will likely do the trick, and if the water is a little cooler in the Winter, it probably doesn't matter. Also, we've been assuming that you'll install your tankless small water heater as a stand alone unit, but many people choose to configure them as a booster to your main water heater. By configuring your small water heater in this manner, you'll have nearly instantaneous hot water until your main hot water heating system can take over. A smaller, less powerful unit will almost always do the job in this case. Stiebel Eltron is an industry leader in manufacturing water heaters. These German made tankless units are not only sharp-looking, but they also show off a sleek, stylish design. Select an output temperature range between 86- and 140-degrees by easily turning the knob on the front panel. With the use of advanced microprocessor technology, the water won't deviate from your chosen temperature, even if the water flow varies. Stiebel Eltron offers a smaller series of point-of-use units (DHC models) with Flow Rates as low as .50 GPM and as high as 1.6 GPM (40-degree Temperature Rise) and are designed for a single point-of-use. The larger DHC-E series offers a Flow Rate up to 2.0 GPM (DHC-E12). This powerful series is capable of handling areas where more hot water is required, such as in the kitchen. The DHC-E series is designed for multi point-of-use. We're big fans of Stiebel Eltron water heaters and their point-of-use units are no exception. The company has strict product standards and quality engineering. In fact, they're so confident in their product that they offer one of the best warranties in the industry. If you're looking for an excellent, hard working small tankless water heater, we don't think you'll be disappointed. These are high-end units, so they'll be higher priced, and depending on the job you have set out for them, you may not want to spend the extra money. 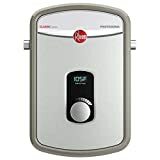 If you're looking for a high quality, energy efficient (99.8%) small water heater, Rheem is a good choice. The company has been around since 1925 and is the top manufacturer of water heaters in North America. We really like the RTEX series. It comes in 3 different sizes ranging from 1.5 to 2.5 GPM and is capable of delivering enough hot water for a small home if sized correctly. If you're looking for a smaller single point-of-use unit, Rheem also has 2 models for the job. One can deliver .50 GPM and another 1.0 GPM. The output temperature can be adjusted in 1-degree increments by using a convenient knob on the front of the unit. With a temperature range between 80- to 140-degrees, these units should be able to meet nearly any personal preference. The immersion heating elements are designed with a brass top to prevent corrosion and allow for easy removal. But don't let the forethought of removal fool you, these heating elements are powerful and designed to deliver years of service. It's worth mentioning the importance of properly sizing a tankless, especially if you're looking for a unit that can service a small home. 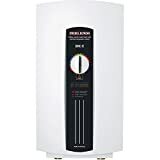 Tankless water heaters don't have a reserve (tank) to store heated water, so if you require more hot water than the unit is capable of heating, you'll be very disappointed. The Bosch Tronic 3000 series is reasonably priced and ultra compact. With the exception of the larger 1.8 GPM unit, you'll have the option to mount the tankless vertically or horizontally. This versatility, coupled with a lightweight design, means these units can fit into the tightest of spaces. With a respectable 98% energy efficiency rating, copper sheathed heating elements and a copper heat exchanger, the Bosch tankless point-of-use water heater is a solid performer for the money. We also like that Bosch uses a 45-degree temperature rise when factoring their GPM measurements, and with 5 units ranging in capacity from .50 GPM to 1.8 GPM you should be able to find the right size. These small water heaters are simply a no-nonsense work horse and they deliver a solid value for your dollar. If you're looking for the next "new" thing, you might want to check out the SioGreen infrared tankless water heater. This unique concept has been around for about a decade, and without a lot of history, it's hard to say if they'll live up the hype. Still those who have purchased SioGreen units seem happy. With four different sizes, ranging from .50 to 2.2 GPM, you'll be able to find a point-of-use or a whole house water heater and anything in between. Infrared Quartz heating elements are used to heat the water. The elements are not immersed within the water, and in fact, don't come in contact with water so they should never corrode. SioGreen claims that these water heaters are "completely maintenance free" and will last 10 to 20-years. We love the concept of an infrared tankless water heater, but we wish they would provide a longer warranty to back up their confidence in the product. Although these units do run on the higher price side, the company has an interesting product and it may just be worth being on the edge of something new. HOT WATER ANYTIME YOU WANT WITHOUT ANY HASSLE! 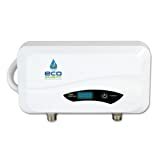 The Sio Green best premium mini tankless water heater point of use is here to help you enjoy your hand wash or wash the dishes with warm water anytime you want without any fuss. The insta infrared heating design will use 110 volt and heat ONLY the water you use with high temp, thus allowing you to save time and money! PATENTED TECHNOLOGY, NO COIL METALLIC ELEMENTS, NO CORROSION, NO MAINTENANCE! That's right! Our tankless hot water electric heater will create heat without direct contact with metals, which will in turn prevent corrosion, limescale deposit and calcium buildup. As a result, you will have to spend $0 on maintenance, No replacement parts, No filter required. 100% SATISFACTION OR YOUR MONEY BACK! That's our unconditional guarantee! If you are not 100% satisfied with your budget-friendly, space-saving and ultra-practical tankless water heater within 30 days, we will offer you a free replacement or your money back. No questions asked! What are you waiting for? Get yours now while supplies last! 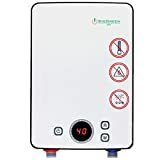 SAVE YOUR BATHROOM OR KITCHEN SPACE WITH OUR COMPACT WATER HEATER, with less than 20 inch length which is not only ideal for small bathrooms, storage, kitchens, sink, rv or cabinets but can be also whole house residential, commercial. The ergonomic size and simple yet innovative construction will allow you to install it almost anywhere or use it as a booster with your tank, including hotels, stores or restaurants deliverying endless gallon of hot water on demand. ADJUST IT TO YOUR EXACT NEEDS EFFORTLESSLY! Our electric tankless hot water heater features 4 power levels (1-4) so you can easily tailor its performance to your family's needs. Adjust the current from 5 amps - 30 amps resulting in 1 kW to 6 kW of power, which is ideal for any home application. Plus, you can easily adjust the temperature using the Water Flow Regulator included in the packaging. Atmor is another long-time player in the electric tankless water heater industry. With a wide range of sizes available that deliver between .50 to 2.25 GPM, you should be able to find the right unit for your needs. The .56 GPM is perfect for a single sink installation. Using a 45-degree temperature rise makes this a nice compact and powerful unit. Although we really like this series because of it's competitive price and solid warranty, owners of the Atmor branded tankless heater seem to be split. Ultimately, we feel that this is a good choice for the price, and properly sizing can frequently be the difference between satisfaction and disappointment. Recommended flow rate 0.56 GPM (Gallons per Minute) = 45°F temperature rise. Slower flow rate = higher temperature rise. Requires a direct connection to a 20 Amp single-phase, double pole breaker. Required wire size: 12 AWG. 240 volts. EcoSmart's tankless water heaters have been gaining in popularity over the last several years. The POU 6 model is capable of heating 1.4 GPM of hot water with a 45-degree temperature rise. Making this a solid performer. The heating chamber is composed of stainless steel and is hand welded. The unit draws 220-volts of electricity and will need to be hardwired. Boat and RV owners enjoy the compact size, yet with it's good looks and versatility it'll fit right into your home. Overall, we like this small point-of-use water heater and think it's worth being on your short list. However, we do have a few concerns. Unfortunately, EcoSmart offers one of the shortest warranties in the industry with only 1-year. In addition, for the warranty to be valid, the unit must be installed by a licensed electrician/plumber within 30 days of purchase. No Hot Water: What Can You Do? Find Top Area Plumbers Fast! Copyright 2018 Water Heater Leaking Info. All Rights Reserved. Amazon Affiliate Disclaimer: WaterHeaterLeakingInfo.com is a participant in the Amazon Services LLC Associates Program, an affiliate advertising program designed to provide a means for sites to earn advertising fees by advertising and linking to Amazon.com.